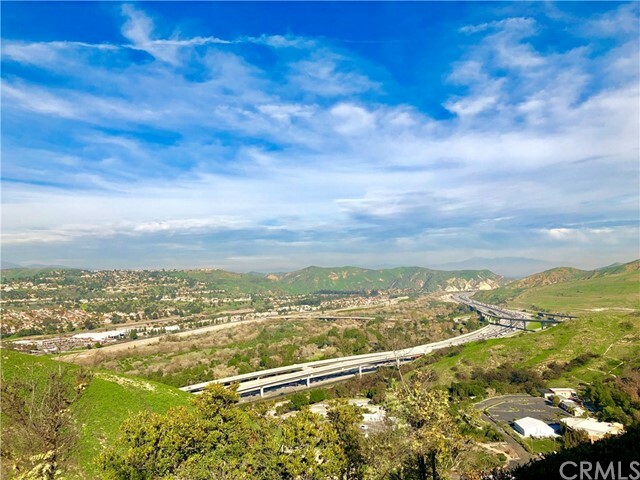 Stunning panoramic view from this home located at the end of a secluded cul-de-sac in the Sunflower community in Anaheim Hills. Walking distance to award winning blue ribbon elementary schools. Situated on one of the larger lots in the area with an extra long driveway that can fit 6 cars! A spacious home with 1941 square feet of living space, this house offers 3 bedrooms. The large upgraded kitchen features tile flooring and custom back splash with newer dark wood cabinetry, center island, granite counters and stainless appliances. Dine in the cozy breakfast nook and take in the beautiful view of the hills and snow capped mountains. The kitchen opens to the living room and formal dining area on one side, and a family room with fireplace on the other side. The family room has beautiful wood floors and sliders leading to the backyard with covered patio, large grass area and unbelievable view! The master bedroom, plus two additional bedrooms are located on the second floor. The master bedroom and bathroom offer a gorgeous view of the hills and features dual his and hers vanities, a large soaking tub with separate shower. Additional features about this property include vaulted ceilings, recessed lighting, loads of windows for natural light, neutral living room paint and carpet, large grass front and back yards. Easy access to dining, shopping and all freeways and toll roads.